India was the third largest solar market behind China and the United States with 8.3 GW of solar PV capacity installed in 2018. Japan and Germany were the fourth and fifth largest solar markets in the world. China added 44.3 GW of solar PV capacity, more than five times that of India during the year, according to data released by the country’s National Energy Administration. This was in spite of an installation cap on distributed projects and reduction in the feed-in tariff for solar projects announced last year. The United States was the second largest market with 10.6 GW of solar PV capacity addition in 2018, according to SEIA/Wood Mackenzie. Japan has not officially released its 2018 solar installations numbers, but RTS Corp, a research firm tracking the Japanese market, told Mercom that it is predicting installations of approximately 7 GW for 2018. Germany’s solar capacity addition for 2018 stood at 3 GW, up 68 percent from the 1.76 GW installed in 2017. Overall, the European Union installed around 8 GW of solar PV during the year according to Solar Power Europe. In total, the top five countries – China, the United States, India, Japan, and Germany – are expected to account for 73 GW of solar PV capacity. The extraordinary pace of China’s solar capacity addition is evident from the fact that the country alone added more solar PV capacity than the next four counties combined. Interestingly, China’s Q4 2018 solar PV addition is more than India’s entire solar PV capacity addition for 2018. Barring a significant policy turnaround in one of these five markets, they could end up in the same order next year. “China, the United States, and India will continue to be the most important solar markets in the near future. Both solar upstream and downstream companies will need to pay close attention and have a long-term strategy for each of these markets,” said Raj Prabhu, CEO of Mercom Capital Group. The United States installed more than double of India’s solar PV capacity addition in Q4 2018 and exceeded India’s total capacity addition for the year. However, by the end of the third quarter, India had installed more solar PV than the United States. It was primarily because of the rapid pace of installations recorded in the first quarter of 2018 when India installed over 3 GW. According to a recent report from Solar Energy Industries Association (SEIA), in Q4 2018, the United States installed 4.2 GW of solar PV, which is a 139 percent increase from Q3 2018 and a 4 percent increase from Q4 2017. China installed 44.26 GW of solar photovoltaic capacity in the calendar year (CY) 2018, which is 21 percent lower compared to installations of 53 GW in 2017 due to restrictive policies. 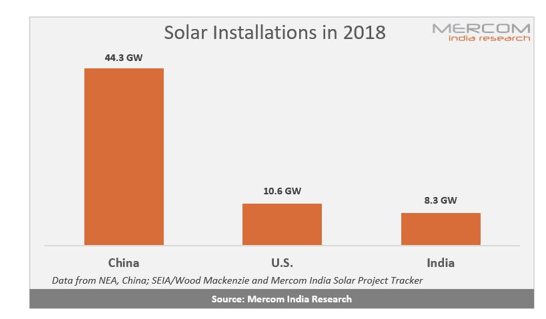 Mercom had previously forecasted 8 GW of solar PV installations in India in 2018 due to a lack of a strong project pipeline. Recently, Mercom reported that the Indian solar market installed 8,263 MW in 2018, down 15.5 percent compared to 9,782 MW in 2017 as the safeguard duty, GST issues, and land and transmission issues took a toll on large-scale installations.